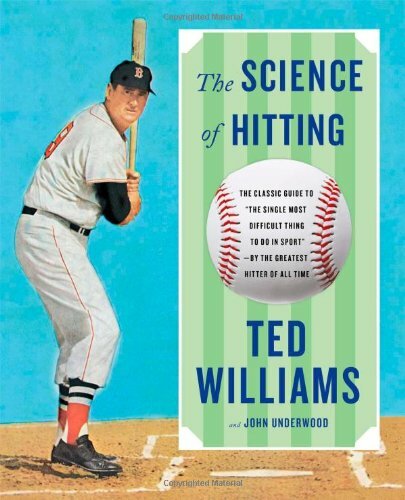 The Science of Hitting: Book by Baseball Great Ted Williams. Just how great of a hitter was Ted Williams? He’s the only hitter that anyone could try to argue was as good or better than Babe Ruth.Ted Williams had an amazing career interrupted by some service for the USA as a soldier during World War II and the Korean War. Despite these significant interruptions, his career totals in many hitting categories are astounding. One of his most famous accomplishments is that he remains the last hitter to top a .400 batting average in a season, when he hit .406 in 1941. Overall his career spanned from 1939 to 1960, and he even hit a homerun in his last career at bat. He said later after retiring that if he had known it would end up being such a big deal that someone hit .400 for an entire season, he would have done it more often. Ted Williams wrote a book about the science of hitting, and I’m here to tell you that not only is it a great book, with incredible advice and drawings and information, but I also know where he got some of the information in this book: From my great-grandfather. My great-grandfather, Lovell Peirce, was a physics professor at San Diego State University, and in about 1935 or 1936 Ted Williams was in his class. He told me that Mr. Williams didn’t seem very interested in physics, until one day my great-grandfather crafted a lesson about the physics of hitting a baseball. He said the lesson got Williams’ attention, who sat upright and listened closely. I actually used this book as a kid, when I played Little League Baseball. The book was part of the reason that as an eleven-year-old I batted .452. In my opinion this book is a serious instructional aid for anyone, from Little League hitters, to softball players, to adults in any league who want to consult Ted Williams’ ideas. I found it very valuable, and I know many others would too. The sounds like a great guide to anyone interested in improving their batting skills. How wonderful that your great grandfather had something to do with this.